If you’re constantly messing around and modding your device, you will undoubtedly have hit a snag or two along the way. When you have an issue, but cannot quite decipher what exactly is causing continual crashes, software malfunction or general bugs, things can become very frustrating indeed. In this instance, some – particularly developers – find logcat to be of particular help, as they help ascertain what isn’t working, why it isn’t working, the steps that can be taken in order to amend the situation. Logs are innately rather interesting – at least to those who know how to read them – and now there’s a handy tool available to the general Android population that not only grabs logcats, but pretty much any log file going. It originates – unsurprisingly – from the thriving community of XDA Developers, or specifically, member wcypierre, and goes by the name of AIOlogger. 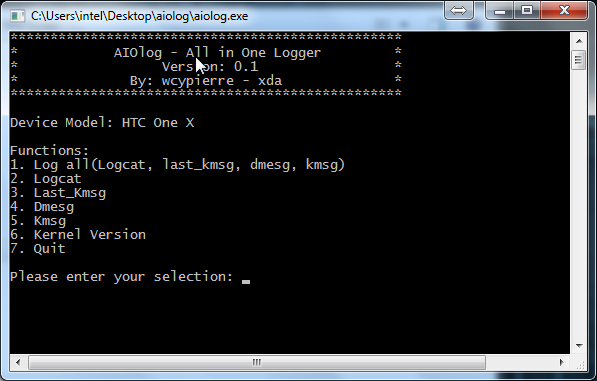 As the name rather openly suggests, it’s your all-in-one log tool, so whether you’re looking to check out a logcat, last_kmsg, dmesg or kmsg log, AIOlogger will have you covered. As well as housing the ability for you to view from many different types of log, it also allows you to view your kernel version, and with additional features such as continuous logging and the capacity to view different types of log at once, it really is your one-stop shop when you hit a software bug. In order to get started with AIOlogger, the process is pretty simple. Fire up USB Debugging on your device, download the required script from this thread at XDA, and run it. From there, you’ll be able to select from a list of options. While the majority of you into your Android development will know what a logcat is, this app makes things a little more accessible to the masses. With an easy-to-operate interface, you’ll find your feet in a matter of seconds, and if you ever should need to have a look at a particular log, AIOlog will cater to all of your needs. If you would like to know more about AIOlog, or if you encounter any troubles in using it, please do check out the original thread over at XDA.